From the ever-popular blue and white dinnerware with a nod toward flow blue to classic white china, there's a vintage pattern to suit every taste and lifestyle. Take a look at 12 different dish designs from popular manufacturers to find your vintage pattern style. 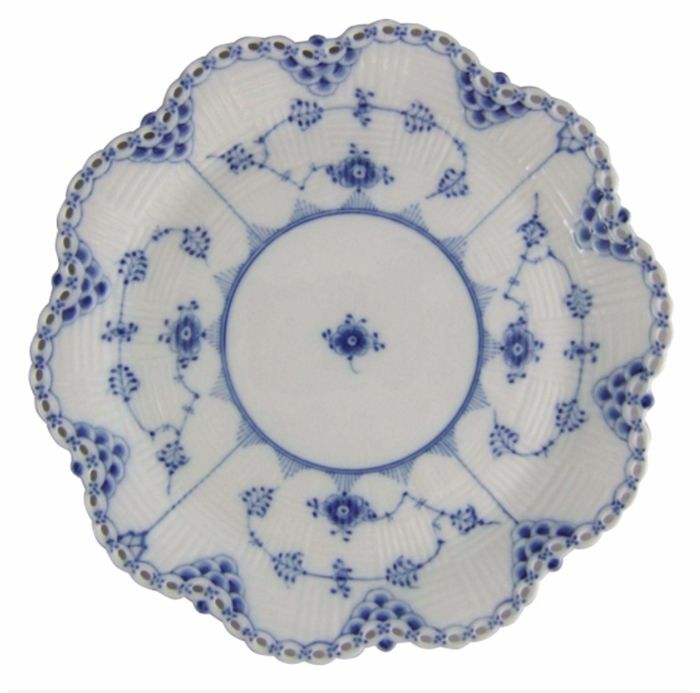 This lovely blue and white antique pattern actually comes in several different versions. The fanciest of these is the Full Lace as shown here. The Half Lace version has less blue edge decor along the fluted rim, while the Plain version has only the central pattern and looping vines. This pattern was first sold in 1775, which is the same year Royal Copenhagen was founded in Denmark. Introduced in 1816, this Spode pattern has been popular for literally centuries now. The Asian-influenced floral border surrounds Italian ruins in this classic pattern. Blue Italian has been continually produced since it first came on the market. Blue and white transferware patterns like these have always been favorites with collectors. This classic dinnerware features colorful decor based on antique botanical prints. It was introduced by Portmeirion in 1972 with 28 different floral illustrations gracing the pieces, each with its own pattern name. The four floral designs shown here are Sweet William, Dog Rose, Purple Rock Rose and Treasure Flower. This pattern, along with others by varied manufacturers, are more affordable alternatives to the luxurious Flora Danica shown below. This elegant pattern was produced by Royal Copenhagen from 1790 to 1960. The decor is based on images from the Flora Danica, a historical encyclopedia containing thousands of plants native to Denmark. This dinnerware is quite expensive on the secondary market today with each piece selling for hundreds of dollars. Never fear if that's beyond your budget and you've fallen in love with the look. There are many other more affordable classic botanical patterns available, including Portmeirion's Botanic Garden. This holly-rimmed china by Lenox is appropriately named Holiday. It was introduced in 1974 and remains a "Top Ten" pattern on the china matching website, Replacements. The Old Country Roses pattern by Royal Albert is perfect for those who enjoy setting a romantic, colorful table. This pattern featuring roses in full bloom was introduced in 1962 and has been popular since its inception. Royal Albert is known for producing many dinnerware patterns featuring roses and other flowers. They are all brightly hued and add a touch of romance to a table. This pattern combines botanical elements, Asian influence and the classic look of a white ground with gold trim. It is both colorful and elegant. The original set, introduced in 1851 at the First World Exhibition in London, was purchased by Queen Victoria herself. Subsequently named for her, this Chinese-influenced pattern demands the skills of Herend's most talented and experienced painters. One of many traditional bone china patterns by Wedgwood, Runnymede Blue is a classic with its navy blue rim. "The "Runnymede" in the pattern’s name refers to the location where King John signed the Magna Carta, and the clamshell design is an example of Josiah Wedgwood’s fascination with mollusk shells," according to Replacements. This discontinued pattern was made from 1972 through 1998. It still imparts elegance to many tabletops with pieces available through china matching services and vintage dealers. A versatile choice, this elegant platinum-trimmed dinnerware is made of high-quality white porcelain Lenox is known for marketing. It has been popular since it was introduced in the mid-1960s. The gold-rimmed version by Lenox, also elegantly classic, is called Eternal. Wedgwood White and Nantucket, also by Wedgwood, are great alternatives for those preferring an all-white place setting sans the metallic rims. If true fine china isn't really your thing, and you prefer a Mid-Century Modern vintage dishware vibe for your table, then check out Starburst by Franciscan. These classics with a funky twist can easily be the go-to "good dishes" in your cupboard​ since they will often set you back as much as some fine china patterns purchased piece by piece. Widely called Blue Willow by most vintage china dealers, this pattern was dubbed Willow by Johnson Brothers. It is based on the Old Willow pattern, which has been in production for centuries. Johnson Brothers started making their high-quality versions of this pattern in the 1930s, and the ​backstamps have changed through the decades. The pattern tells the story of a wealthy Chinese girl who falls in love with a commoner. They flee together to elope and are pursued by her Mandarin father. At the end of the story, the young couple transforms into a pair of doves as shown in the pattern detailing. This tale has many different iterations, as noted by International Willow Collectors, and is often passed down from generation to generation as these dishes are used for serving. Many companies made Blue Willow dinnerware, but the Johnson Brothers editions are regarded as among the best versions available. A beautiful turkey platter is a must for the fall, even if you just display it rather than using it for serving. If you want to wow during your feast, set the table with a pattern like Woodland by Spode. This classic brown transferware pattern evokes a harvest feel, but it doesn't scream Thanksgiving. With decor featuring rabbits, horses, pheasants, and turkeys, along with other woodland creatures, it can be used year-round if you like. If you want to go all out for Thanksgiving, there's no better pattern than His Majesty by Johnson Brothers featuring a handsome turkey in all his glory. How are Transferware Dishes Made?